Fresno State Technology Services is hosting Design Thinking workshops on March 19 and March 20. These are two separate half-day to full-day workshops (four to six hours) to introduce and dive more deeply into design thinking processes. 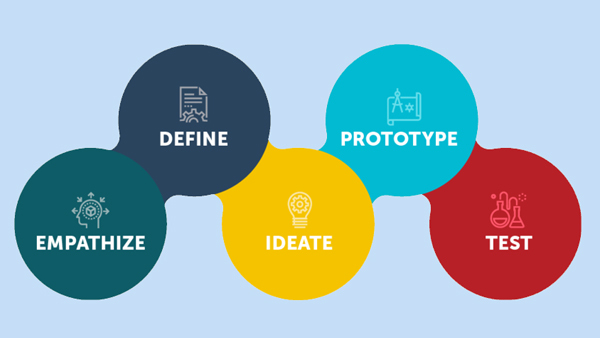 Design Thinking, a set of principles and process steps that start with the user at the center, will help you design technical solutions in a way that ensures user adoption of essential protocols and systems. Using the steps outlined by the Stanford D-School, you’ll learn how to focus on the right problem to solve while engaging a creative, yet disciplined process that solves real challenges for people. Workshop participants will learn how to cultivate a common language/mindset/approach to their work, helping them understand the concept of empathy in particular and how it relates to advancing work and meeting goals while maintaining a user-centered perspective. Join us on March 19 and 20 for some active skill-building exercises with our facilitator, Holly Morris centered around Design Thinking. Holly will help us learn the Design Thinking process and provide an opportunity to apply it to a current challenge at work. Exciting! What does Design Thinking have to do with IT? Everything!